You have to hand it to the Germans. They seem quite capable of the more serious business of economics (small “e”). Where Economists (capital “E”) like Draghi play the game of somewhat data dependent, businesses in Germany refuse license to the same luxury. They are business dependent, meaning that if things really were booming they would act that way. And if something like recession looms, the Germans would know it. And that’s exactly what they’ve said for much of this year particularly the past four or five months.  The global economy, which heavily influences Germany’s, is heading for another downturn. For Europe as a whole, it’s a whole lot of trouble. The European Union’s statistical body confirms today what German sentiment has been warning about. The European economy is already on the precipice of recession. 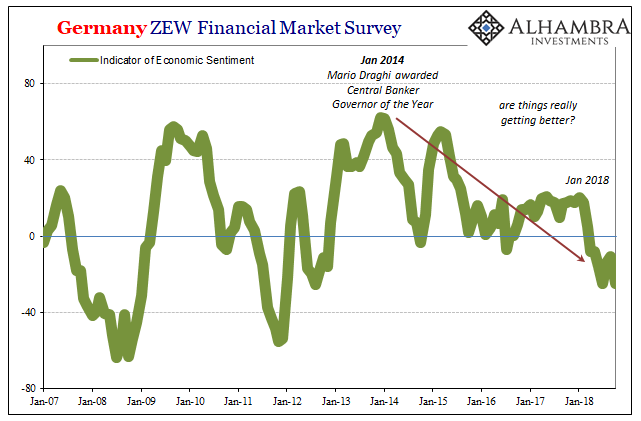 The ZEW survey in September was as low as it was when Europe was last contracting. In Q3 2018, Eurostat reports that GDP expanded by just 0.16% over Q2. That was about one-third the rate in Q2, which was itself about three-quarters the gain in 2017. Data dependent. 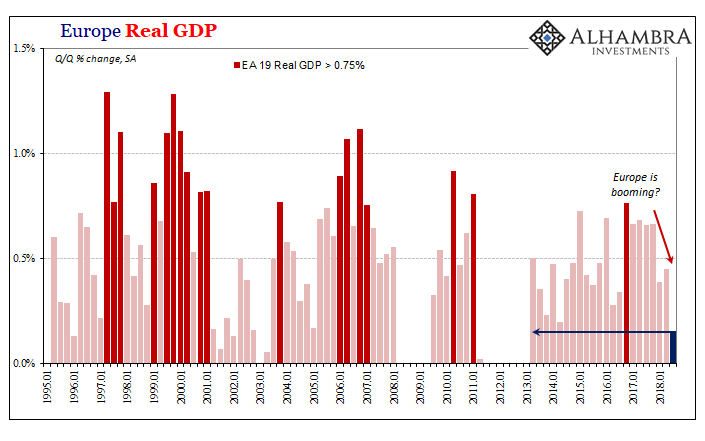 Like the ZEW index, GDP growth was the lowest since Europe’s last recession. This is quite a change from just three quarters ago. The latter half of last year was a veritable golden age for central bankers. They couldn’t contain themselves from seeing actual success within their grasp. At least that’s what they thought. If they had actually been data dependent they might’ve been far more cautious if still somewhat optimistic. In truth, they seized on some positive numbers and hyped them as far as they possibly could. The economy of 2017 in Europe or anywhere else really wasn’t anything to get excited about. It was, consistent with the last decade, nothing more than the same low ceiling upturn we’ve experienced since August 2007. The question now is whether it was intentional misdirection, an economic fraud of sorts. 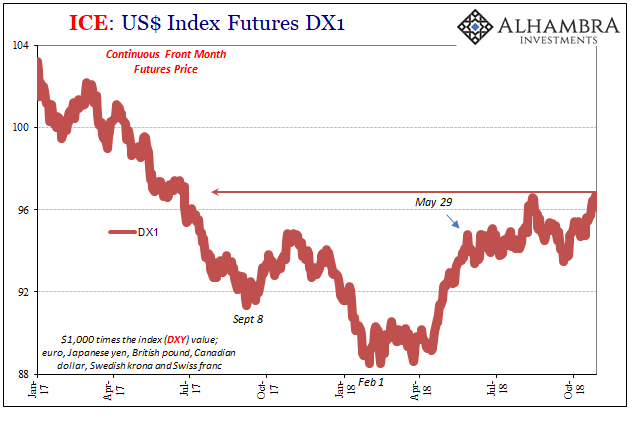 You give people the idea of QE, money printing supposedly, and then some positive numbers and then let them imagine a boom. 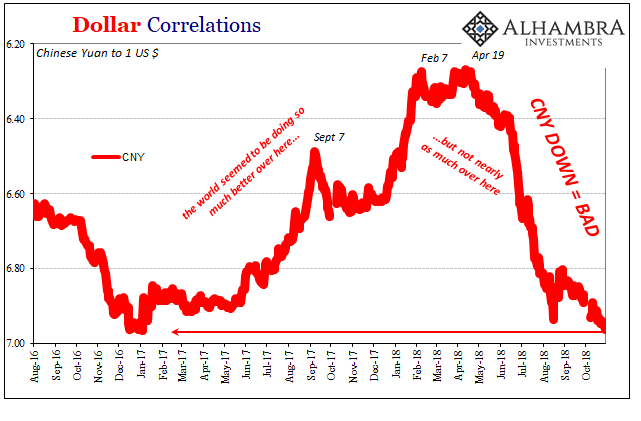 Monetary policy that since Paul Volcker’s reign has been ruled by expectations management rather than money supply actually believes if enough people believe, it becomes self-fulfilling. It’s not data dependent, it’s sheer lunacy. This is Economics. Therefore, the results have been rising insanity. Picture yourself as an Italian. Europe’s political class tells you, based on Economists’ math, that you better just accept the way things are, that you don’t know how good you have it. Europe’s economy is booming and therefore you must be some form of detestable “ism” to resist their carefully laid plans. 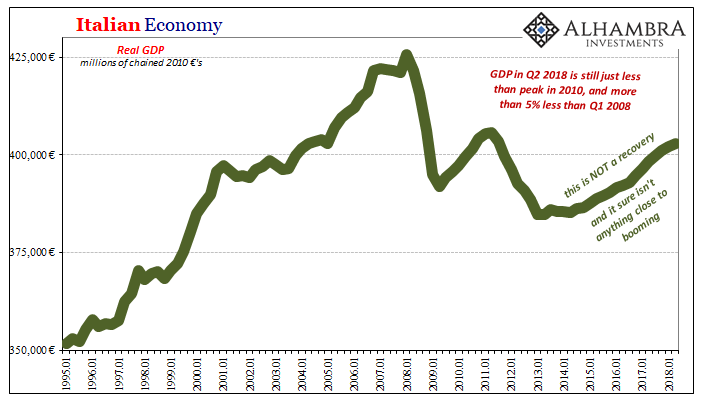 Now, all of a sudden, the European economy as a whole is slowing and even contracting in some parts. You never felt this boom they talked about endlessly and now you can sense even that might be gone. And that’s why it is really dangerous. Because Italy’s economy, Europe’s third largest, has shrunk. In Q2 2018, the latest Eurostat figures for Italy alone, Italian GDP was still 5% below the peak in Q1 2008. Five percent is a huge contraction for any single recession. Stretched out over ten and a half years it is nothing at all like recession, it is absolute criminal corruption. Not the kind where officials are looting the Treasury, but intellectual corruption that is far more dastardly and ultimately destructive. And if Europe’s economy as a whole is now at best slowing, you know as an Italian the chances Italy’s economic condition will somehow change for the better is practically nothing. For if Europe isn’t growing, Italy hasn’t a prayer. The Italians, they are data dependent. 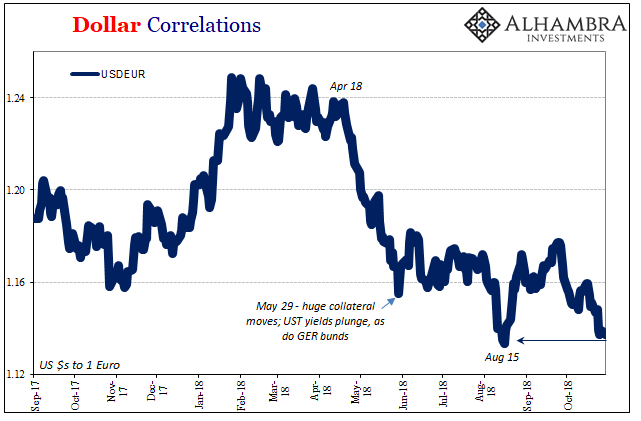 This would be alarming enough on its own, but Europe’s sudden economic struggles in 2018 quite against all mainstream expectations and perceptions presage rough times for more than just unfortunate Europeans stuck with Draghi and the ECB. Economists and policymakers (redundant) in the United States currently gloating about some US boom should take note of the tone and audaciousness of their European counterparts late last year. The President’s recent rhetoric with regard to Powell suggests that he has. From the get-go, in January, 2018 has been a huge disappointment. That already told us Economists hadn’t actually been paying close attention to data and making honest assessments. As it goes further along, though, we may end the year in far more dangerous than merely frustrating circumstances. 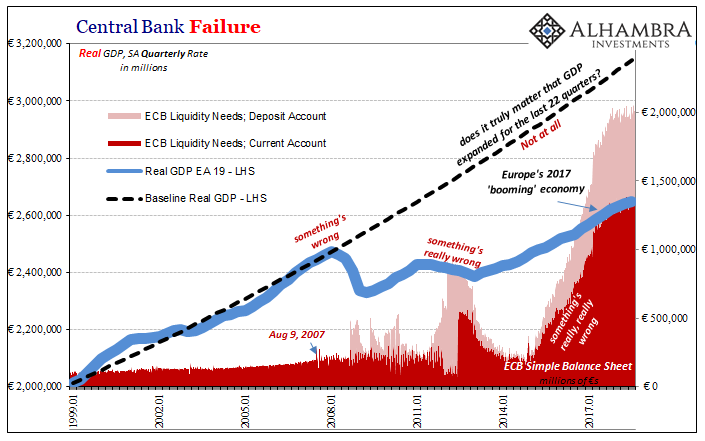 By all means, end QE. To do it close to or perhaps in full-blown recession would be perfectly fitting for the whole regime. The reasons and justifications won’t matter. That’s because it didn’t, and doesn’t, matter. QE or no QE, the global economy isn’t moved by central banks. They are, and have been, irrelevant. That much should be painfully obvious by now. They really don’t know what they are doing. It’s starting to show, again, for a fourth time. The world simply will not stand for much more of this.